Historic Brattonsville welcomes to Hightower Hall potters from all over the Carolina Piedmont to showcase and sell their pottery. 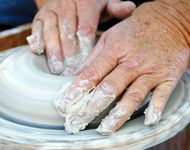 You will meet traditional and contemporary potters as well as Catawba potters, too. There will be talks by noted pottery experts, pottery making demonstrations, and the chance to win free pottery. Take a break from shopping and enjoy some toe-tapping bluegrass music and local barbeque while relaxing on the lawn of Hightower Hall. There are wide open spaces for the kids to run and enjoy the day! The day promises to be a special one, so grab your family and come on out and enjoy the first feelings of fall. COST: Adults, $8; Seniors, $7; Youth ages 4-17, $5; Ages 3 and younger free. CHM members admitted free of charge.